Closet Gallery — The Organizing Co.
Name a closet, and we can tackle it: linen closet, coat closet, hall closet, master closet, kids' closets, office closet, laundry closet, etc. Whatever those tight spaces throw at us, we can declutter it, organize it, and maintain it. Here are some examples! This Denver, CO closet appears spacious, but has some storage challenges. We were able to reorganize it so that clothes are more accessible, jewelry isn't tangled, and getting ready is a breeze. We adjusted the cookie-cutter shelves and hang bars to suit the needs of this client and purchased some simple, yet powerful, organizing supplies. Sometimes cute organization products aren't very functional, which was the case with this arrow jewelry holder. Not only did the client need more space, but it also wasn't easy enough to get earrings off of it. 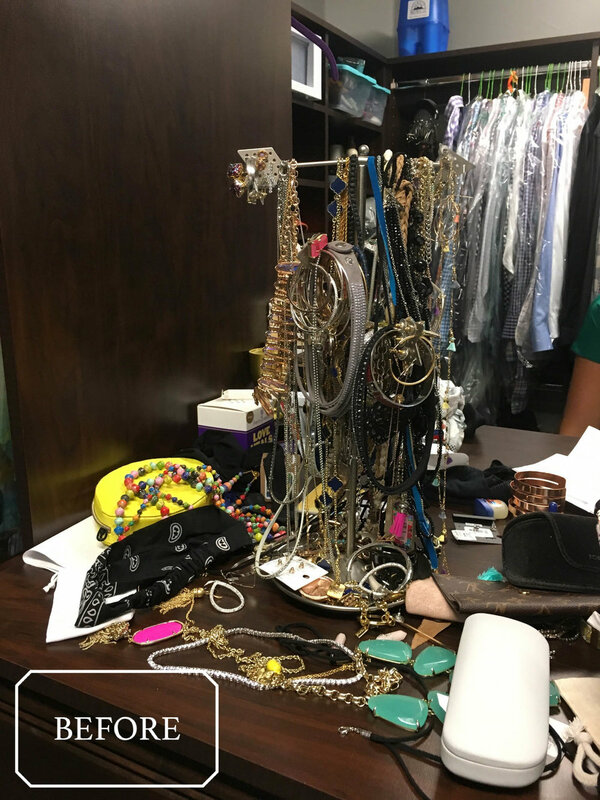 So we reorganized the client's existing jewelry box to include space for studs and dangle earrings, and relocated the bracelets and necklaces to holders more suited for those types of items. "Wendy from The Organizing Company is amazing! She took what I considered to be an insurmountable task.... organizing years of accumulated clutter.... and made it look easy! She organized my garage, office, bookshelf and closets! She gave me great tips to help me stay organized and truly made calm out of my chaos! Thank you Wendy!!!" "We had such a lovely experience with Christina! She helped us organize a bedroom that serves as my husband's study and our home office. She even organized an additional closet when she suggested some items would be best stored in another room! Christina goes above and beyond, does wonderful work, and all with such a pleasant and understanding disposition. She creates a relaxed, judgement-free zone to help you get a handle on your annoying organizational difficulties. I loved asking her how she organizes her own life - "where do you file paperwork?" "how do you hang onto extra buttons so you can find them when you need them?" "what is your advice for dealing with mail?" - she has wonderful (and chic) ideas! She even took a trunk-full of stuff off our hands that we hadn't gotten around to donating. Above and beyond!"